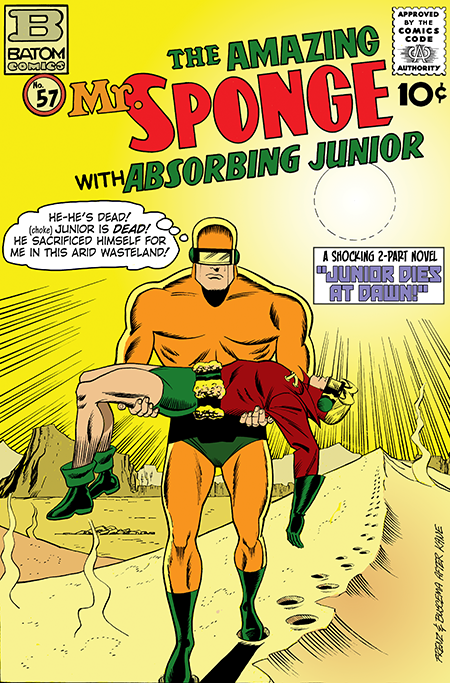 When the the first issue of The Amazing Mister Sponge hit the stands, Batom Comics and its publishers, Barry and Thomas Martin has their second success. The fans had really taken to the fledgling comic book companies characters. Writer Flash Freeman and and artist Phil Holt now had their hands full producing two comic books every month and their editor Brady Wentworth knew that he was going to have to bring some help on board if he wanted to move forward with the new ideas that were dancing around in his head. Little did he know that Providence was about to lend a hand. About a week after the inaugural issue of The Amazing Mister Sponge hit the stands, Brady received an over-the-transom submission from someone named Mitchell Knox. The unsolicited pitch was for a couple of kid characters named Charlie and Chuck. Brady immediately saw the appeal that such a book would have for his young readership. He knew that Batom wasn’t publishing the New Yorker and was always cognizant of just who his readership was. When The Amazing Mister Sponge was being developed, it had been Brady who had suggested that the pugnacious porifera have a kid partner named Absorbing Junior. Since Mitchell Knox lived locally in the nearby community of Grafton, Brady he immediately wrote back inviting Mr. Knox to meet with him at the Eaton Building to discuss developing these new characters. At the very least, Brady wanted to put the talents of this newcomer to work for not only had Knox written the submission, but he had laid out roughs for the entire book as well. Here was someone that Batom Comics could not afford to let get away.